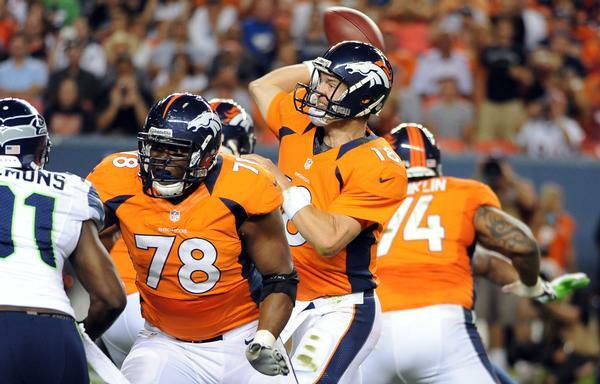 Home » DENVER BRONCOS » Will Ryan Clady’s Foot Injury Injury Detour Broncos’ Road to the Super Bowl? Will Ryan Clady’s Foot Injury Injury Detour Broncos’ Road to the Super Bowl? Denver Broncos’ All-Pro left tackle Ryan Clady’s streak of 85 consecutive starts is about to end. Clady has started every game since being taken in the first round of the 2008 draft, but he will not be starting next Monday night against the Raiders. Clady suffered a Lisfranc sprain in the arch of his left foot in Sunday’s win against the New York Giants. This could be detrimental to Denver as Clady is expected to be sidelined for several weeks, possibly even the rest of the season. This is a huge blow to the Denver Broncos who signed Clady to a five-year, $52.5 million extension back in July. In two games, the Broncos have scored 90 points and Manning has passed for 769 yards with nine touchdowns and zero interceptions. But this may all change if Clady is out for the year. Manning was only sacked three times in the first two weeks of this season and only 21 times last season while Clady protected his blind side. Hopefully Clady’s backup, Chris Clark, can protect Manning just as well. He is unproven in the NFL, but Clark did practice through the off season and training camp with the first-team offense while Clady recovered from shoulder surgery. Clark just signed a two-year contract extension Monday.